As a renowned Manufacturer, Exporter & Supplier from Uttar Pradesh, we offer different types of Teflon Bellow Shaft Seals for diverse applications. We make use of excellent quality raw materials for the fabrication of our durable Shaft Seals. Owing to its excellent functionality and longer operational life, our Seals is are in demand. 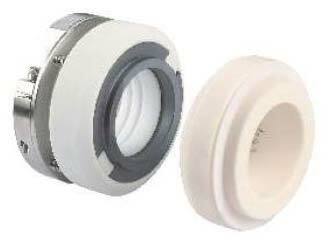 Buyers can contact us for both bulk as well as urgent orders for Teflon Bellow Shaft Seals. Description : Type HS-30S series seals are outside mounted, suitable for highly corrosive chemicals like Acids, Salts, Alkalies etc. The Seal components that come in contact with fluids are made of chemically inert materials like PTFE Bellow, GFT, Ceramic, Silicon Carbide. All hardwares are in Haste-Alloy-C, Alloy-20 etc.